INSPIRATIONAL QUOTE reads "Yes. I Teach. 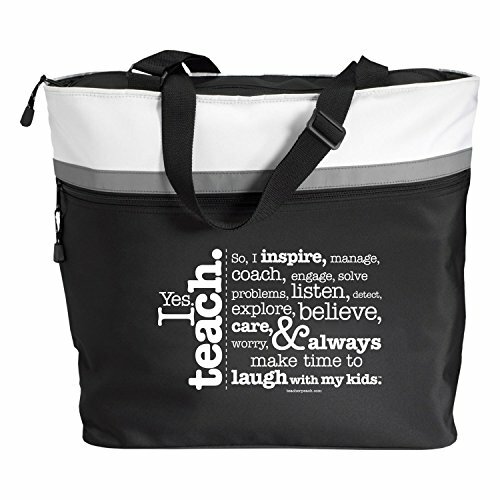 So, I inspire, manage, coach, engage, solve problems, listen, detect, explore, believe, care, worry, & always make time to laugh with my kids"
Teacher Peach is the go-to brand for amazing teacher gifts and motivating classroom products that help teachers inspire kids to become confident and creative-in school and out! From certificates, greeting cards, positive postcards, and more, teachers recognize student success-easily, economically, and of course, effectively with Teacher Peach classroom products. With Teacher Peach's popular and coveted teacher gifts, it's easy for families and PTOs to champion and support these amazing teachers-with amazing products that matter to them! Plus, Teacher Peach donates 10% of the profits from every product sale to fund initiatives designed to help raise confident and creative kids through its nonprofit fund, teacherpeachseeds.org! Inspirational quote reads "Yes. I Teach. So, I inspire, manage, coach, engage, solve problems, listen, detect, explore, believe, care, worry, & always make time to laugh with my kids."